Watch “(Do It on My) Twin Bed,” “First Got Horny 2 U,” “Back Home Ballers,” or any of the other hits penned by Chris Kelly and Sarah Schneider during their tenure at Saturday Night Live, and it’s easy to see a pair of silly, joyful writers with a shared affinity for what Kelly describes as “taking a nostalgic thing and exploding it.” It’s a collective voice the duo cultivated over the course of six seasons at SNL and have now carried with them to their new Comedy Central sitcom about fame and failure, The Other Two. Beyond just laughs, however, sketches by these former co-head writers had a subtle but noticeable impact on the tone of SNL: They nudged the show toward embracing a more gay and feminist sensibility. This week’s episode of Good One explores one of Kelly and Schneider’s proudest achievements: an unusual trilogy of ad parodies for Totino’s Pizza Rolls. Over the course of three years, their quiet takeover of SNL can be seen in the subsequent beats of this parody — from lampooning a man-centric Super Bowl ad and providing a bleak look at the patriarchy, to playing on indie-film clichés and inviting an ecstatic sexual liberation. Listen to the episode and read a short excerpt of the discussion below. Tune in to Good One every Monday on Apple Podcasts, Spotify, or wherever you get your podcasts. So it is Monday before the Super Bowl. J.K. Simmons in the host. Is anything being pitched about Totino’s? Chris Kelly: I think “Totino’s” started because Vanessa [Bayer] pitched a version of this character as a live sketch. CK: Sometimes a cast member will say, “Oh, I have this idea where I say ‘Mmmm,’” and you’re like, “Cooool … I … don’t know what to do with that.” But sometimes it will just hit you perfectly. Vanessa doing this woman, it just made our brains go to places. Do you talk it out, or do you just know? CK: We improvise it and see what makes us laugh the most. SS: With this first one, we definitely took her character to a darker place. 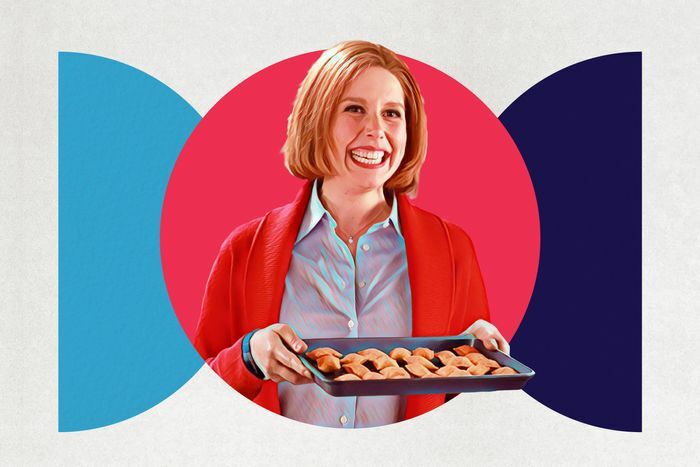 CK: Yeah, smiling through pain is Vanessa Bayer’s sweet spot. We didn’t get to write with her every week, so I think that sketch was us, as fans, writing a spec script for Vanessa Bayer. What was the evolution of the idea? SS: This was calling out commercials that are so focused and marketed to men. If there’s a woman, she comes in to bring beers and then disappears. That was the impetus — just being like, Where does she go? CK: She delivers the treats and then stands absolutely still in the kitchen until someone calls her. We were like, She needs some cards or something to play with while she’s back there. We liked that it was rude but phrased as a compliment. SS: For her own rude product. When the sketch aired, did you get any notable feedback? JF: The first year, Totino’s responded. SS: They sent us a full fridge of Totino’s. It was a takedown of Super Bowl commercials, but it’s not the best for Totino’s, so I was surprised! A year passes, the Super Bowl is coming up once again. Larry David is the host. When and how does it come up to do another “Totino’s”? SS: We loved that first one, and we don’t get to do stuff with Vanessa much, so we were like, Could we continue to play in this world? We knew going into it that we would not want to just keep playing in the “‘Activity Pack” world. We would want it to have a different tone. But not commercial parodies. So what was the process? CK: Sitting down to come up with a second one was stressful. CK: I was cast so many times in Maude sketches at UCB — lights up on a bunch of guys watching TV, and they’ll be like, “Go, go, go, go, oh!” We all know that’s like, “I get it. They’re watching the game.” But we started talking about how stupid that was. SS: But then blew it out to a really creepy level. It ends up being an X-Files commercial. CK: We had known what the idea was going to be for a while. We talked about the idea of this lesbian love affair, and this indie movie. When we found out who the host was, we were like, This is so comically perfect, it’s insane. SS: This was Vanessa’s last year. And we had spent so much time with this lady that we were like, She needs to find her truth. CK: As stupid as that sounds, we wanted her to find happiness at the end of it. This one has the most jokes of all of them. CK: We didn’t have to write guys anymore, so we were like, Women? Gay? We can do this! SS: It’s also not jokes in the traditional sense. It’s tonally committing to this being a Totino’s love story. CK: I pitched the idea of this lesbian story, and I assumed that it would leave the kitchen and the commercial structure and we would follow them on an indie movie. And Sarah was like, “No, the whole story should absolutely just be happening behind the couch, on the kitchen island.” It was like such a no-brainer. SS: That’s what I’m really good at. CK: I remember feeling embarrassed that that hadn’t occurred to me. I volunteered to quit writing, and she would not accept my resignation. SS: Whenever I add to one of Chris’s ideas, he has to quit. What do you remember from shooting? SS: We did “The Beygency” with Andrew Garfield when he came. He’s a fantastic actor, so this feels like a real movie with real stakes. It was the same thing with Kristen Stewart. She came in and we were like, Oh, now this is a real trailer. CK: There’s no one who could have been better at that. The first moment she was on camera, she turned and looked at Vanessa and we were like, This is fantastic. SS: While we shot this, I developed a crush on Kristen Stewart. SS: She was super personable. Sometimes hosts are very separate, and that’s fine. I was sitting, she came over and crouched and put her elbow on my knee to just, like, talk. And I was like, I’m gonna leave my boyfriend. So the husband at some point goes, “What’s taking so long with these Totino’s? You guys making out back there?” What did you want that moment to say? CK: Well, that’s a joke in straight commercials or TV shows, right? “You guys making out?” That’s a joke you hear all the time, and we like that, yes, they are making out. SS: If only you would look at your wife once during this big game. CK: He truly has not looked at her for three years, and if he just looked, he would know. Looking at it now, what do you feel about this “Totino’s” trilogy? CK: The sketches are sweet. We like them. We love Vanessa. It’s embarrassing — we like the happy ending that this character has. I think it’s indicative of our tone. It starts a little mean with this straight male football vibe, and then it’s not even about that. It’s just a woman finding happiness.